Start the hunt and find some pirate treasures! Pirate Slots is one of the latest additions to Bitoomba’s bitcoin slot machines. It offers an exciting way for players to win bitcoins in just few spins. 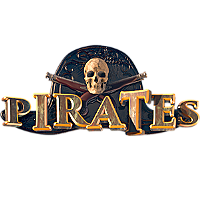 This is one of the Bitcoin slots you must try your hand at because in this game, being the captain of your own pirate slots game is made more fun and easy. One of Pirate Slots’ features that will definitely whet your gaming appetite is its graphics and sounds. Compared to other pirate-themed slot machines, Bitoomba’s slots certainly provides more enticing pirate ambiance. In fact, the first moment you see the game, you will instantly feel the taste of adventure you will have once you give this slot machine a spin. It is packed with crisp graphics and lively sounds that will motivate you for more spins until you find some hidden treasures in this bitcoin slot machine. Aside from the fact that ‘boredom’ is nowhere in this Bitcoin casino game, you can sure play Pirate Slots with utmost convenience. The interface of the game is smooth as well as easy to get acquainted with. In addition, the control buttons are straightforward so you can place your bet, choose the number of lines, spin, and win in no time. To play this game, you must first have an account at Bitoomba. The process takes less than a minute since the required details are just your username, password, and email address. Once your account is set, you can make a deposit by scanning the QR code shown or by sending bitcoins to the wallet address given. At Bitoomba, credits are used to give you easier and accommodating gaming experience. Your bitcoins will be converted to bitoombas (1 BTC = 100 bitoombas) that will be credited to your account after one network confirmation. Pirate Slots can be played in one up to thirty lines. The decision on how many numbers of lines to play is yours. Of course, your chances of winning increases the greater number of lines you play. On the other hand, the minimum bet for this bitcoin slots is 0.01 bitoombas and the maximum bet is 5 bitoombas. Lastly, this Bitoomba Slots is jam-packed with bonus features you must get the most of. It gives Wild Symbols, Scatter Symbols, and Bonus Symbols to give you delightful and rewarding spinning experience. Spin Pirate Slots and you will never regret it. Aside from the aforesaid offers, there are more spinning surprises waiting for you. Be the richest pirate ever once you find chest of bitcoins in this slots game. You don’t need the pirate skill and even good eyesight in this slots game, all you have to do is give it a lucky spin to win.